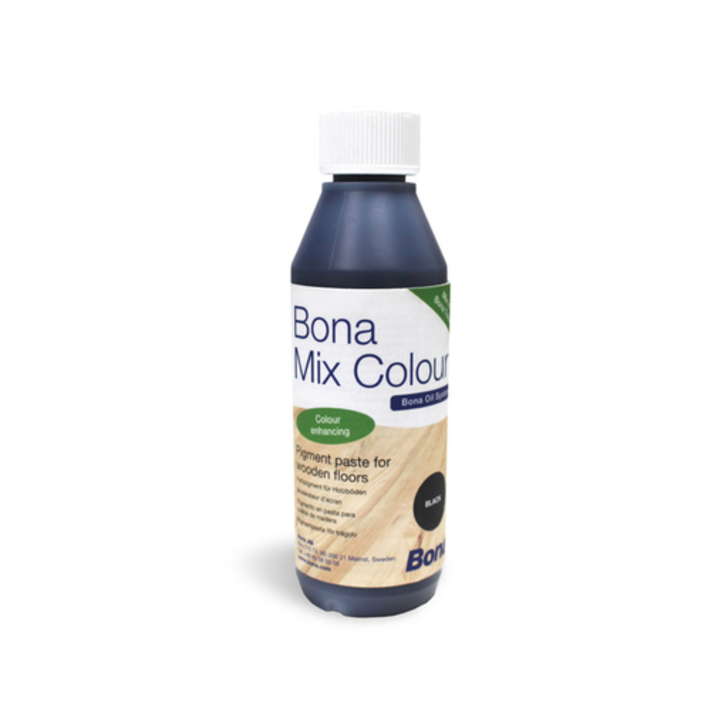 Bona Mix Colour is a concentrated pigment paste for waterborne systems and specifically for Bona Nordic Tone and Bona Rich Tone. Added to either of these products it can intensify or change the colour of the Bona Tone to create a special effect. Note that the surface must always be complemented with an oil or hardwax oil treatment afterwards. Fire risk: No, see Safety Data Sheet for more information. Cleaning: Clean tools with water and soap. Dried material can be scrubbed away with soap and water. Storage/transport: The temperature must not fall below +5°C or exceed +25°C during storage and transport. Disposal: Wastes and emptied containers should be handled in accordance with local regulations. 1. Shake the pigment bottle and add to Bona Nordic or Rich Tone, max 5%. 2. Shake the mixture carefully. Follow the instructions for Bona Nordic Tone or Bona Rich Tone for application.